This high quality overbed / chair table is ideal for use in the bedroom or the lounge and comes with split legs - excellent for wheelchair users. 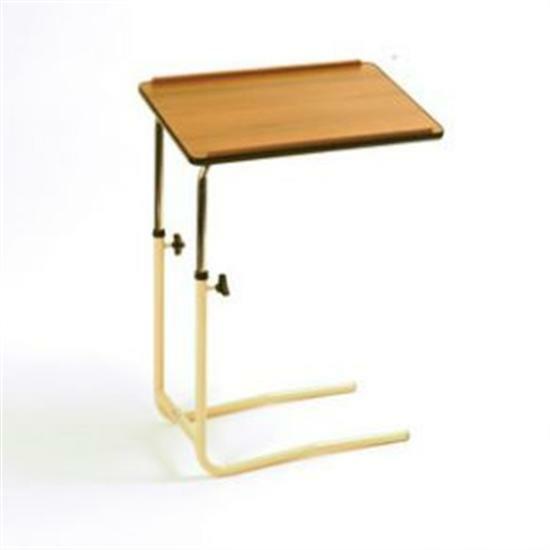 The table comes with easy to slide flat legs, so that the frame can be pushed under bases with little clearance e.g. deep base divan beds or armchairs. The table is height adjustable and tiltable. The laminated wooden table top is easy to clean and has a rasied lip on the top and bottom ideal for preventing items falling off the edge. Really loved it... It was for my 99 year old grandmother who has difficulty in moving around and this is just perfect for her to sit in her sofa chair and have her meals on it... So much that one of my other sisters also ordered one.